I convinced him to shrink wrap both trees this year. Yay less work for me! Calvin & Hobbes makes everything better. Head over to Dave's Geeky Ideas for the free download - and while you're there, check out the rest of his blog of geek product concepts, like this Hungry Hippos necklace. I'm newly addicted. Anyhoo, as papercraft goes it doesn't get much easier than this; all you cut out is a box, an arrow, and a flat 2D image. I was so careful cutting out Hobbes' fur, though... only to discover this morning that Tonks decided to groom their little heads overnight. (Hence the blurry, waterlogged bits.) DANGIT, TONKS. Ok, grammar peeps, help me out: Shouldn't the second comma - the one after "flame" - NOT be there? Weigh in in the comments. Because this is the internet, dangit, and THESE THINGS MATTER. And to end on a laugh, you guys watch True Facts by Ze Frank, right? And you've seen his latest one on armadillos, right? And, I NEED that shirt to go with my plethora of grammar words here. I jumped on here to say just that. Professional editor here: neither comma should be there, but I like Pegster's idea below that it indicates breaks in the verse. It's not the best solution, honestly, for the game devs to have come up with, but it makes partial sense. 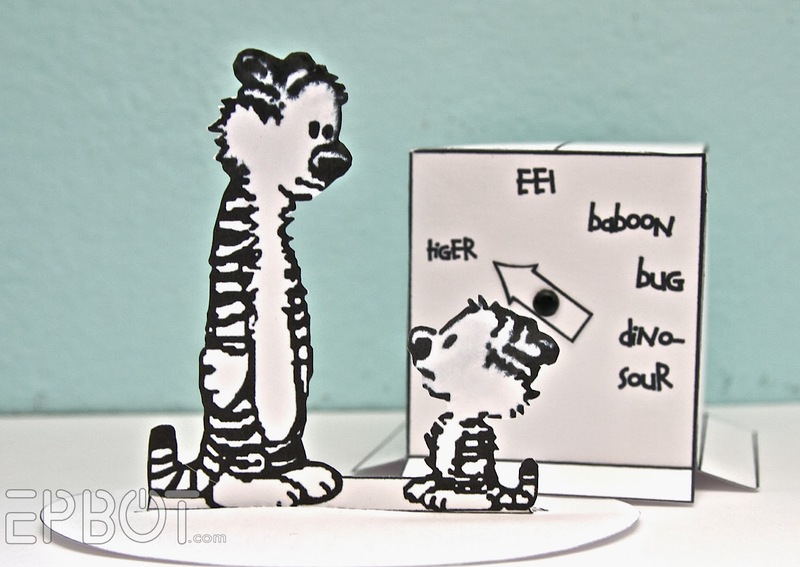 CALVIN & HOBBS! I will be cutting these out and displaying in my office tomorrow. Ze Frank ROCKS. JEN ROCKS. Thanks for being you and sharing all the cool geeky stuff you find wonderful. I think the comma is there to indicate the end of a line of prose. It's not grammatical. I think the first comma is unnecessary and the second one is utterly wrong. The sentence is at risk for being misinterpreted as the seed of the prophet sitting on the mountains of man -- one more word and it'd say she sat the throne of the mountains of man, as well as drowning them in flames. Hi there! English major, here. :) O.k. Both of those commas are in the wrong places. The first one is redundant. (No commas are needed before the word "and". The second one.... just shouldn't be there. The sentence could read: "The seed of the prophet shall sit on the throne and drown in flame the mountains of man." This would be a perfectly acceptable sentence. I think the real problem here is that they took a poetic sentence and tried to lay it out like a regular sentence and this made the grammar wonky. "The seed of the prophet shall sit on the throne/ and drown in flame/ the mountains of man." See what happened there? The places where there would normally be poetic line breaks is exactly where they ended up putting commas (which is, of course, an incorrect use of commas). Hope this makes sense. Fourthing this! I edited my grandpa's novel plus two of my own, so I studies commas A LOT!! Fifthing! (Quinting?) Also, it desperately needs a preposition in between "shall sit" and "throne". I can't see one on that image, and everyone seems to be adding "on" which makes the most sense but isn't there right now. No..."sit the throne" is an expression. Just like "sit a horse". In Holland, we use commas a lot... Maybe the person who wrote this was Dutch? 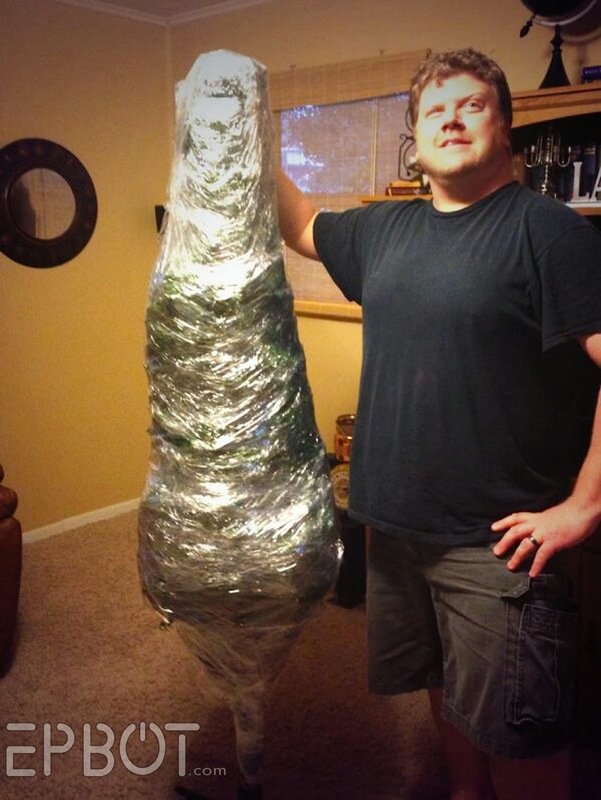 I almost forgot to mention that the shrink-wrapped Christmas tree looks like Shelob. Thought you'd appreciate that! A comma is sometimes used as a pause in a haiku. Given that this is read in a game they may have been put there for emphasis. Thanks for introducing me to Dave's Geeky Ideas' blog. I'm going through the "Geek Bling" tag and am laughing over and appreciating Etsy’s Rude and Reckless Jabba the Hutt Necklace and other posts. 1) I don't know what the whole quote should be, but I'm guessing that the questionable comma should be a semi-colon. and 2) I LOVE MY GAMING PC. I bought it last spring. Seriously, the best way to play videogames is to play them on the computer. I've basically abandoned all my other consoles (except my N64) because almost everything runs better on the PC. The only things I play on consoles are exclusives. But since the XBox 360 "exclusives" are usually ported to PC really quickly, it basically just functions as a Netflix player these days. What kind of gaming pc do you have? Do you mind sharing your specs? I was going to ask Jen what kind they got as well. I am looking into getting myself a new one and have been on a laptop so long I don't even know what's out there anymore, sadly. I bought a custom-built PC from someone else, and then replaced some parts with updated or better parts. I'm currently on vacation, but when I get back and can make sure the specs in my head are correct, I'll let you know. 2) Thank you for the video links! I'm a science teacher and I WISH I could show these in class. I'm obsessed with owls and that one made me laugh so hard! Thanks again! The way that this sentence is written now, the second comma changes the meaning to the seed of the prophet drowning in flame. The part about the mountains of men looks to be the beginning of another thought. I'm in the camp that says both commas are wrong. Take out the first comma and it makes sense. It depends. If the mountains of man are being drowned, then no comma. If the seed of the prophet is being drowned (and is also known as the mountains of man) then it's fine. 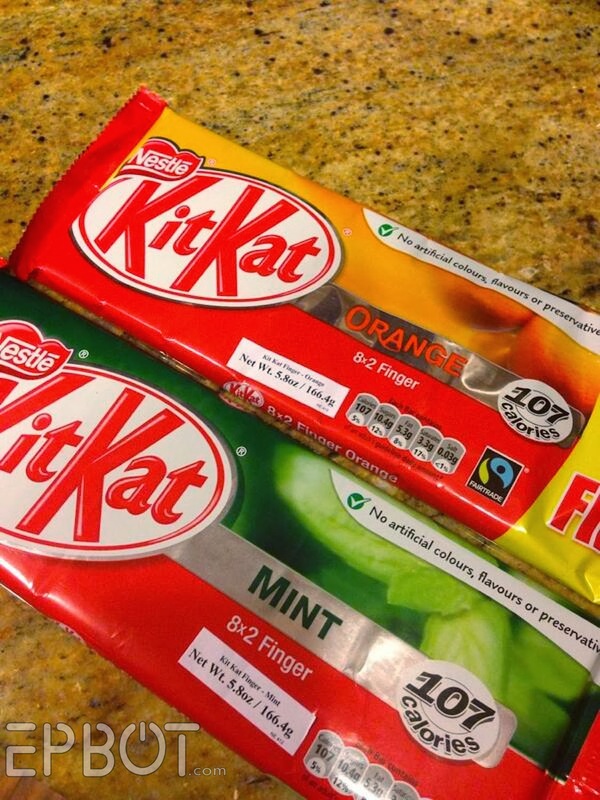 Ok, about the Kit Kat, try the Hazelnut one! It will change your life. I bought five and put them in my own stocking. They are so yummy! I'll presume they aren't line marking devices, as I'd have one after "Prophet" if they were. People are saying the first comma shouldn't be there. The issue is that this is not modern (as in the last several decades, not centuries) English. Comma usage has changed, and even during my lifetime we've gone from "use it" to don't use it." There is a pause there in the SPOKEN rendition of the passage, and that should be noted in the WRITTEN version under rules that existed relatively recently. The subject may be the same, but there are two separate predicates. The second comma, however, messes up the sentence. Without it, it says that the prophet's child will rule, and also that that person will bring destruction on man's works. With it, the prophet's child drowns in flame, and a sentence fragment is spliced onto the end without context. I came to say that NEITHER comma should be there*, and I'm leaving wanting one of Amy's mocha KitKats. How can you tell it's a mail plane? Because of the tiny balls. Ahahaha. 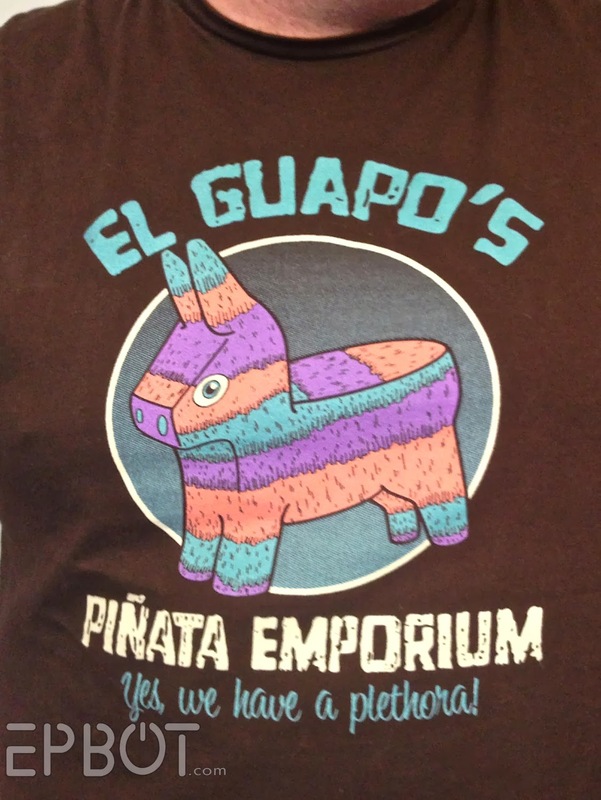 I might have to get one of those El Guapo shirts. I'm not a huge fan of either of those commas. When in doubt leave it out. "My little Buttercup has the sweetest..."
Love that movie. And that comma needs to go. Neither comma should be there, unfortunately. If you only have two things joined by the "and" conjunction, you don't use a comma before "and": "bread and butter" instead of "bread, and butter." Me: "Oh, no! You have to send this shirt back immediately!" 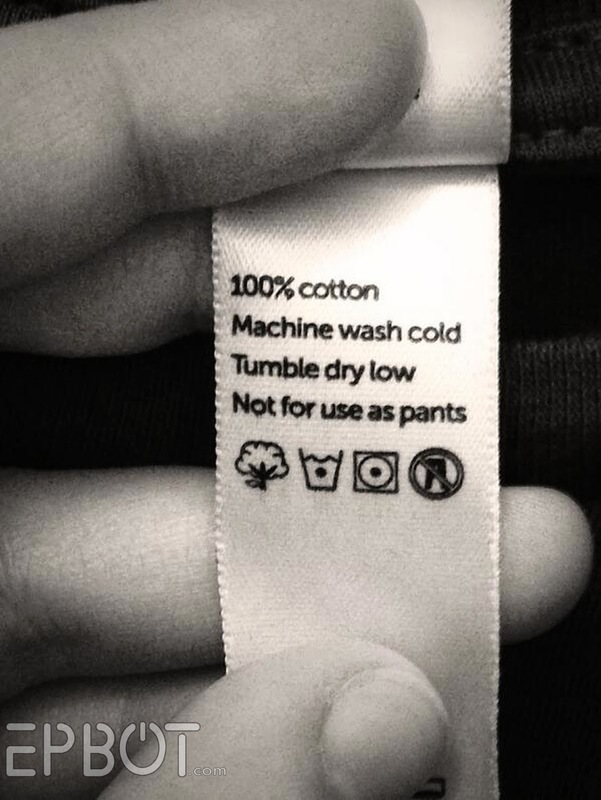 Me: "Because you can't use it as pants. How misleading!" Him: "Oh, you're right! I'll email them later about it." Thanks so much for making us aware of that Amigos shirt! It's a classic for my fam! I just love how your Doctor's name is "Tenpenny" it is a name straight out of a steampunk novel!! Right? Or maybe Harry Potter. Either way, it's fabulous. The only justification I could see for the second comma is if "the mountains of man" is modifying "flame." Perhaps the comma is ok if the first half of the sentence, the seed sitting the throne, has no cause and effect relationship to the second half. So the seed sits the throne, and independent of, or concurrent with that, the mountains of man drown in flames. Kind of a backward construct for the idea, but could be. Like saying, "And decked with holly, the Smith's halls" or "And exist with largeness, Zack Morris's phone." "The seed of the prophet shall sit the throne and drown in flames the mountains of man," is correct. Attempting to justify the commas, we can speculate that the mountains of man are the throne. If so, drowning in flames is an aside and could justifiably be separated from the sentence with a set of commas. It'd be like, "The seed of the prophet shall sit [on as a] throne the mountains of man, and oh, he'll also drown the mountains in flames, by the way." I'll leave the commenting on commas to others. I'd just like to give a shout out to Red Bubble, who also has awesome tags (it's the little things, right?) "Do not slap pandas", "Do not tease geese" are some we found on our t-shirts this Christmas. And the tags come attached to the cutest little clothespins I've ever seen. They make me want to make…something…out of them. Haven't figured out what just yet. I actually bought that same Plethora shirt when it first appeared on Woot. But being the scatterbrained idiot that I am I didn't notice I was purchasing a smaller size than needed and thus have never worn it. But I keep it in my closet in hopes that someday it will fit. Oh yes, it will fit. Do not disparage the wasabi KitKats! They are made of awesome. Admittedly, I prefer the green tea and the purple sweet potato ones, but the wasabis are actually pretty tasty and not overly hot. I'm not a fan of the corn or watermelon ones though. Purple sweet potato?? I would SO try that. There are also cheese and shrimp kit-kats (no chocolate on them, think wafers with Cheetos cheese and like shrimp flavoring). I brought some back from Japan for my brother and he said the cheese were pretty good; but, he couldn't bring himself to try the shrimp. You're right. That second comma should totally be a period. The offending comma should not be there. I try not to read any written words in games too closely. They're riddled with errors. Thank you for continuing to blog! Good luck with everything. While the story of the Sea Whores is an impressive video, have you seen the Morgan Freeman video? Morgan Freeman, Morgan Freeman, Morgan Freeman. This one made me cry laughing. Mountains of man = Corporate constructs and legal fictions created by man in the name of control/justice/government which seem like large impenetrable structures. Love and freedom will rule the world in peace once the prophet's words are followed and Man's creations have been destroyed by the fires of truth. Nice to see even mainstream things like video games trying to point out to people that the world is run by corrupt slavers and that we are all unwittingly their slaves. Gives us freedom fighters a little more hope to see things like that. Sorry to all of you that think there should be a period or something, study up on how grammatical structure has changed over the centuries, you might be shocked at how vastly the language has evolved. On an unrelated topic, I know I am hugely late in this, but I just started playing Minecraft and am totally hooked. I just wish I could invent my own recipes, I have so many ideas! I am currently playing on a server that pays me BitCoins to mine and build! It is fabulous! That shirt! I have a burning need for it. The Three Amigos is one of my all time favorites! Grammar: It looks like they're using commas to mark the end of the lines of a poem (not so much bad grammar as horrific punctuation), except the top line is either twice as long or they don't feel the need for a pause between the first two. As written as prose, either comma should be excluded (preferably both). In order to create the correct timing/pauses, you need something to be after "throne" and "flame". A n-dash would be my recommendation, but it would make it very Emily Dickinson. I love that you care about grammar in a video game! I also agree that extra comma is...just extra lol! But now I also have a very strong desire to play Infinite all over again...for like the 6th (or is it 7th...8th?!) time. I love this game, I'm not a huge gamer anymore (not because I don't wish to be, but simply due to lack of time) but I can't express how fabulous this one is. It's just simply beautiful and I always get a catch in my throat at the end! It depends: if 'and drown in flame' is an interjection, then yes, both commas are necessary. It's a more gentle version of "The seed of the prophet shall sit the throne - and drown in flame - the mountains of man." If its saying that the seed will sit the throne, and also (but independently of the other action) drown the mountains in flame, then no. I haven't played the game - is the throne in the mountains? I thought the dispute was going to be about the fact that the poster says 'shall sit the throne' instead of 'shall sit ON the throne'. That's the one that's bugging me to type. The comma has been thoroughly discussed. I'm writing to thank you for sharing ze Frank. Enlightenment AND snark, how marvelous! I shall be sharing this with my snarky minions. Love all you do, Jen!